Some figures are cast as heroes and others as villains. Emanuel Moravec - the face, voice and main force behind Czech collaboration with the occupying Nazis during WWII - unmistakeably belongs to the latter category. For his actions he became dubbed ‛the Czech Quisling’ – a reference the more famous Norwegian collaborator. In this week’s Czechs in History, Chris Johnstone explores Moravec’s complex character and path to collaboration. Hitler signs Munich agreement While Moravec never wielded the same power as some of his collaborationist peers in occupied Europe, he was perhaps an even more ardent supporter of German aims than many and attracted even greater hatred from most of his countrymen. Part of that hatred probably stemmed from his seemingly abrupt turnaround from being a vehement advocate of defending democratic Czechoslovakia against Germany. A supporter of president Tomáš Masaryk, Moravec was even one of the pall bearers at his state funeral in 1937. Historian Jiří Pernes is one of the few Czech historians who has written about the former Czech Legionnaire, Czech army officer, military expert and journalist turned collaborator. For Moravec, like many Czechs, Munich was a turning point. It discredited the Western democracies and the international attempts by the second president, Edvard Beneš, to keep Germany in check through a series of alliances. 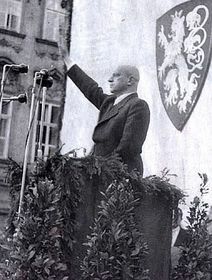 But for Moravec, there was even worse to come under the short-lived Second Republic with a new Czech government trying to appease Nazi Germany. He was forced to quit teaching at the main military academy, given indefinite leave from the army and banned from writing articles for newspapers, one of his main sources of income. Moravec at one point was even thinking of emigrating to Costa Rica. Moravec – who had left-leaning sympathies in the interwar period – also saw Nazism as a social revolution and this probably helped in his conversion as well, he adds. With trepidation – he feared imprisonment or worse - Moravec proposed his services to the SS’s intelligence service. In spite of his past anti-German stand he was welcomed. 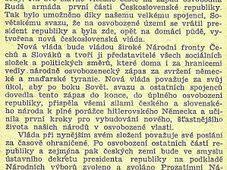 With mainstream Czech newspapers still reticent about publishing openly collaborationist material before the outbreak of WWII, Moravec turned to Czech Radio. From August 1939 he had the opportunity to comment once a month on events at home and abroad. In one of his earliest broadcasts from October that year he explained his motives for collaboration and the historical reasons for it. 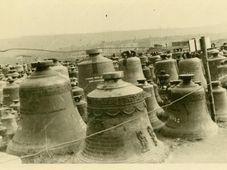 Edvard Beneš The German occupiers were happy with the results and offered him more frequent radio appearances. From May 1940, Moravec was on the air once a week. Some of the early broadcasts were collected in a book entitled “In the service of the New Europe”. He also helped the Germans organise a team of Czech journalists who could help put their propaganda message across to the local population. Moravec’s role of unrestrained collaboration and obedience to his masters can be contrasted with that of the then Czech Prime Minister of the Protectorate government, Aloise Eliáš who gave no ground to the Germans unless he had to and kept in contact with the exiled government of former president Beneš in London. 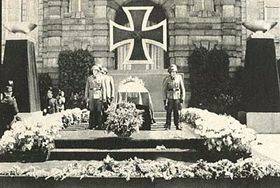 Heydrich's funeral Moravec really came into his own when Reinhard Heydrich took over as acting protector of Bohemia and Moravia in September 1941. 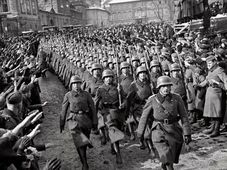 Heydrich wanted a tougher clamp down on what little Czech resistance there was and more Czech commitment to the Nazi war effort. 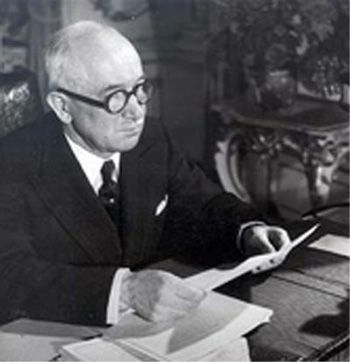 Moravec formed part of those plans and was made minister of education and national enlightenment in spite of opposition from President Emil Hácha. At one point he declared that there was no need to reopen Czech universities because Czechs did not need them. Moravec also ordered his own ministerial uniform – a mix of Czech army SS uniform – which he was proud to wear. Part of Moravec’s task was feeding the occupier’s propaganda to the domestic audience. Whether Moravec was successful or not is a moot point. But it is some sort of tribute to him that the exiled Beneš government considered Moravec as an alternative target for the assasination squad that was finally dispatched to kill Heydrich. Jiří Pernes Moravec was one of Heydrich’s favourites and many thought the bald and not very military looking Czech would suffer from his death. That was not the case. 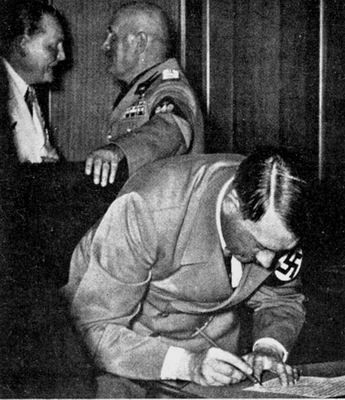 Moravec showed his worth by masterminding the offer of a 10 million crown reward for finding Heydrich’s killers. On the domestic front, he succeeded in sidelining collaborationist and fascist rivals. Some were even sent to German concentration camps. This made Moravec the indisputable leader of the Czech collaborationist camp. With the war slowing turning against Germany, Moravec stepped up his efforts to be useful to his German masters. He launched the Kuratoria – a type of Czech Hitler youth. He also backed the Czech League against Bolshevism which was launched at the start of 1944 with the aim of persuading Czechs to fight alongside Germans against the advancing Soviet forces. Both initiatives were failures. According to Mr Pernes, it is not likely that Moravec ever knew of some of the most radical and far reaching Nazi plans to deal with Czechs if they had won the war. He was however to denounce Jews in line with Nazi race policy. With the allies closing in on Prague from east and west, Moravec knew he could not expect any salvation. He decided to commit suicide on May 5 1945 as the long-expected uprising against the Nazis started in the Czech capital. At the request of the Germans, Moravec was on his way to a broadcasting station still in German hands. They, mistakenly, thought Moravec could calm things down. The truck ran out of petrol. Afraid of being lynched, Moravec took out his pistol and shot himself through the head. Despite being the prime Czech WWII collabator, historians, especially Czech historians, have shunned Moravec. Mr Pernes, whose 1997 book is an exception to this rule, believes shame is probably one of the main reasons. “I think for Czech society the shame that someone like Moravec could have existed played a certain role. Also, under Communism, there was a certain political lack of interest in that dark chapter of Czech history being remembered and retold,” he continues. The Communists preferred to concentrate on the treachery of the West and Soviet liberation than this problematic personality. The episode featured today was first broadcast on June 10, 2009.